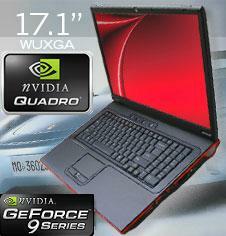 Ultimate Gaming and Application Performance in a notebook you can carry on the move? That'll be the DIVINE-X M570RU. With Intel's latest Penryn Core 2 Duo processor and the power of NVIDIA's new 8800M GTX 512MB (DX10) Graphics card this revolutionary thin gaming notebook the latest and best technology money can buy.